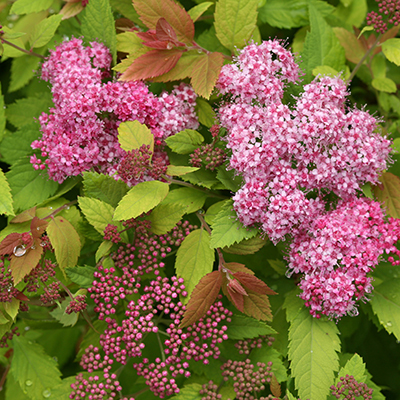 The New Spireas – Compact Gems | Faddegon's Nursery, Inc.
May 18, 2016 | Shrubs, Trees & Vines, What's New? The new spireas have loads of appeal. Their size, color variations and easygoing nature bring versatility and interest to our gardens without overwhelming the landscape. As accents, borders or mass plantings, these varieties really deliver. Double Play® Big Bang has been one of the most successful new landscape plants since it first came on the market. Tim Wood from Spring Meadow Nursery in Grand Haven MI, cross-pollinated spirea ‘Wilma’ with a spirea japonica in 2003. In 2005, ‘Tracy’ was born and given the trade name Double Play® Big Bang. Why a new name? It’s very descriptive. Double Play because ‘Tracy’ offers 3 season color. Why not Triple Play? Everyone wonders! Big Bang because she has the largest flowers of any spirea. It is definitely a big bang when her bright pink flowers bloom in spring above glowing orange leaves. As summer begins the foliage turns chartreuse! And the show doesn’t end there. When fall arrives the leaves turn a rich red-orange. ‘Tracy’ grows to a height of 3 feet with a spread of the same. Perfect for mass plantings or as a specimen. Easy to grow in sun or part sun and deer resistant. Zones 3-9. It’s a bee and butterfly attraction! ‘Superstar’ has a color show all her own but with a different palette! In spring, scarlet red foliage emerges and gives way to purple flower buds while leaves now turn dark green. The flowers bloom in a beautiful clear pink from mid-spring to mid-summer. As fall nears, watch the leaves turn copper and bronze! Once again, a great compact form has been achieved. ‘Superstar’ reaches 2 to 3 feet in height and 3 to 4 feet in width. Minimal pruning is required. Plant in full sun. Zones 3-8. ‘Blue Kazoo’ is for lovers of blue in the garden and is a newer member of the Double Play® Series. The foliage has shades of green, blue and purple for a stunning effect. It would be a winner even if it didn’t flower. But it does! and when it does you’ll be presented with traditional white spirea flowers in abundance. This is just a beautiful specimen which develops rich red foliage in the fall. The height is 2 to 3 feet with a spread of 2 to 3 feet, obviously a nice mounded shape. Plant ‘Blue Kazoo’ in sun or part sun. Zones 3-8. ‘Elf’ is the name of this spirea and they weren’t kidding when they named it! The mature height is 6 to 8 inches (yes. Inches!) with a spread of 1 to 2 feet. The smallest of the spireas, ‘Elf’ has the same unfussy personality in a small package. Use for edging a path, garden borders or a great rock garden plant. Bright yellow foliage makes a great companion to perennials or annuals. The blooms are light pink and will rebloom sporadically during the summer. You’ll also love the deep golden fall color adding to the seasonal look of garden beds. ‘Elf’ will appreciate a full sun situation. Zones 4-8.